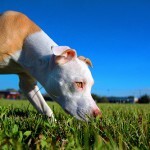 Should our dogs be subjected to elective cosmetic surgeries such as ear cropping? Supporters of the practice cite the reduced risk of ear infections that come with it, while those against call it completely unnecessary. Here’s what you need to know about ear cropping. So you think cropping your dogs ears will help fight off ear infections? Think again. 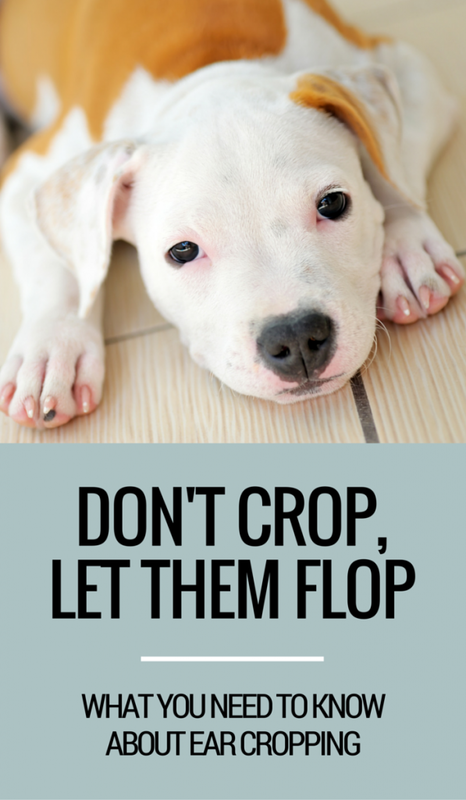 Proponents of ear cropping love to tell you that it’s not just for looks – it’s for their dogs health. The problem is that cropped ears don’t actually help protect against ear infections. Approximately 80% of dogs never get an ear infection, and that estimate includes all dogs whether their ears are cropped or not. The number one risk for ear infections is genetic predisposition, and dogs that traditionally have their ears cropped aren’t in that list. 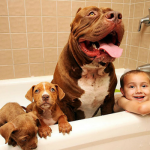 Certain breeds with long, floppy ears are prone to ear infections it is true, but that’s not the case for Pit Bulls, Great Danes & Dobermans – breeds that commonly have their ears cropped. Dogs such as Cocker Spaniels & Bassett Hounds, which are prone to chronic ear infections, have a greater density of apocrine glands & other genetic factors that increase their risk for infection – not just because their ears as floppy. A dog’s genes are what makes them prone to chronic ear infections, not floppy ears. Despite what supporters say there’s no health benefit to cropping a dogs ears, it’s just for looks. Humans have the luxury of choosing to undergo cosmetic procedures if we want, our dogs aren’t so lucky. We’re the ones who decide on their behalf. Have you seen an ear cropping procedure? If you get queasy by the site of blood I wouldn’t recommend watching one. (though if you’re curious it’s not hard to find plenty of them on Youtube) Under general anesthesia the dog (usually between 6-12 weeks old) has up to 2/3 of their ear cut off. After the surgery the dog wears tape & bandages around the ear – in hopes of getting them to maintain an upright position. I say ‘in hopes’ because I’ve seen plenty of botched procedures that end up looking pretty horrendous. Because the practice is elective & for cosmetic purposes it’s come under a lot of scrutiny from animal welfare groups & veterinarians. The American Veterinary Medical Association (AVMA), the Canadian Veterinary Medical Association, the Australian Veterinary Association & the American Animal Hospital Association (AAHA) all oppose ear cropping. They deem it purely cosmetic in nature with potential negative outcomes for the animal. Ear cropping has been banned in parts of Canada, all of Australia, New Zealand & in Scandinavian countries. And in 2009 Banfield Pet Hospital, one of the biggest veterinary chains in America, discontinued cosmetic ear cropping & tail docking. What’s wrong with natural, floppy ears? In my research I found a lot of arguing back & forth about spay & neuter surgeries, and whether they’re necessary. The argument is that just like ear cropping we choose to spay & neuter our pets, which makes it an elective surgery. While this is true that it’s elective there’s a big difference between choosing to cut some of your dogs ear for looks versus spaying & neutering our pets to help fight against the millions of homeless pets that are euthanized each year. 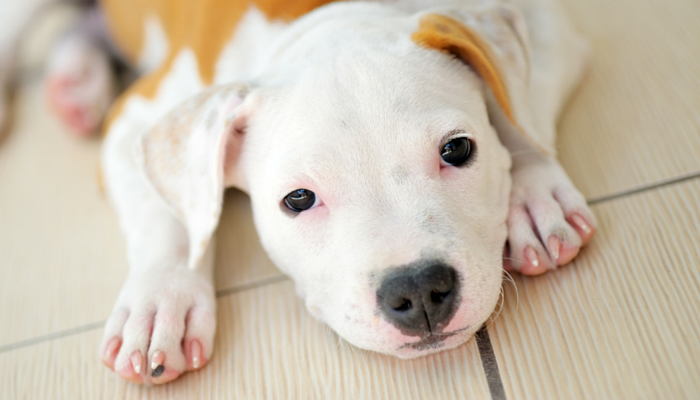 Spay & Neuter helps control unwanted litters of pups that are at risk for ending up shelters. Approximately 1.7 million homeless dogs are euthanized in American shelters each year. While it’s a nice try for some sort of valid argument the fact remains – dogs aren’t euthanized because they have floppy ears. There’s a big difference between taking steps to help control the pet population via spay & neuter vs cropping a dogs ears. Comparing ear cropping to spaying & neutering is ridiculous, it’s apples and oranges to me. 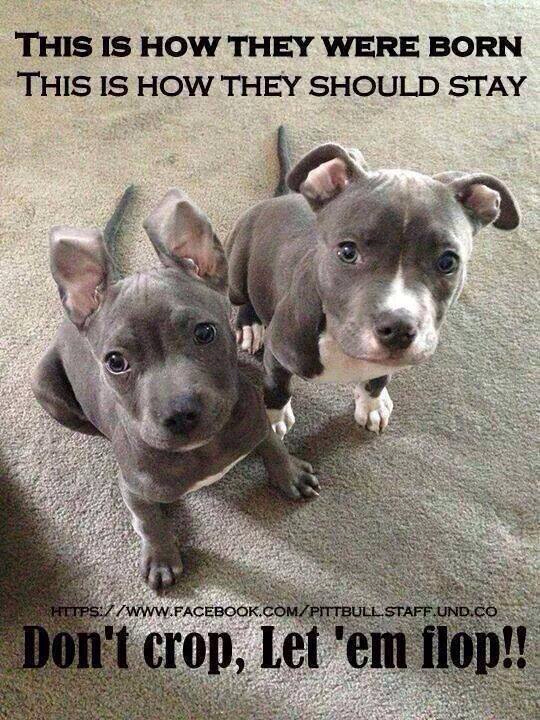 Choosing to crop your dogs ears is a decision made for your benefit, not theirs. It’s made because you prefer the look of an upright ear over floppy. Maybe you think it makes your dog look more imposing, or maybe you just prefer upright ears. That’s fine, but at least admit that it’s done for your benefit alone, not the dogs. While I’m not going to assume I know how painful the procedure is, and whether there’s a lot of psychological trauma involved I can say this – I don’t think your dog would choose to have a lot of their ears cut off – it’s not beneficial to them in any way. Ear cropping is done for cosmetic purposes, not medical. 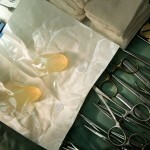 Why risk an unnecessary medical procedure? Why can’t we just let our dogs remain the way they were when they came into the world – with those natural, floppy ears. Breed clubs tell us there were medical or work-related reasons for cutting off body parts years ago, which they say ended up setting a “breed standard” for people’s expectations of their appearance. There isn’t evidence pertaining to any medical benefits of removing body parts or even logical explanations of why the practice continues (other than the horrific truth of fighting dogs having less to bite when ear flaps, pinna, are cut off). 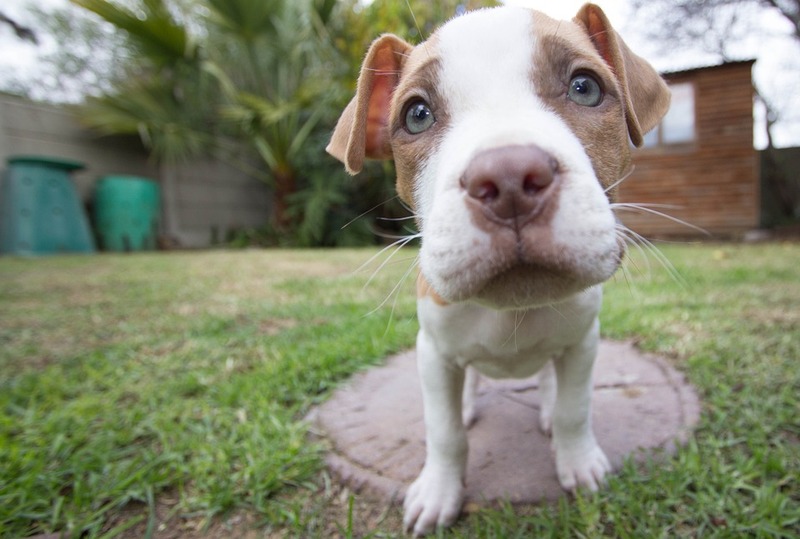 Dr. Karen Becker, Is Cropping Dogs’ Ears & Docking Tails Cruel? How Do You Feel About Ear Cropping? Does your dog have cropped ears? If you were to adopt a Doberman or Great Dane would you choose to have their ear cropped? Have you seen any botched ear croppings? Not a fan of ear cropping? Help spread the word. « Why Do Dogs Get the Zoomies? I love the floppy ears, too. And you’re right – a lot of people try to do this at home, that’s a very scary thought indeed. I’m pro-choice. It’s not my dog, and not my decision. Almost none of the breeds on my to-own list are cropped, so it’s a moot point for me. I have more issues with docking and dew claw removal than cropping. Our weim puppy is having his tail docked. While I love a long, whip-like tail (Ace has one), I don’t really mind if the pup’s tail is docked. I think the reasons for it are silly and mostly based on tradition, but I don’t think it’s a big deal. With the ear cropping, I like it even less because it’s strictly cosmetic as you said. There’s really no reason for it other than breed standard. I do want a dobie some day, and that may mean he’ll have cropped ears if I go through a breeder. If I were to adopt a dog no way would I have the tail docked or ears cropped unless for some odd medical reason like chronic happy tail which I’ve seen. Our pup will have his dew claws removed which I am in support of generally. Ace has his dew claws though and we’ve never had an issue thankfully. I’m not very familiar with dew claws. Up until Laika I’ve never had a dog with them before, and I can tell you that nail needs to be kept super short or else it gets stuck on stuff all the time. Ace has his dew claws. All our previous dogs were purebred goldens and springers and the vet just recommended having them removed during the spay surgery. I really like the floppy ear look much better and I hate to think about the pain our miniature schnauzers went through when their ears were cropped when I was growing up. I actually fainted in the vet’s office while the vet was stretching one of our dog’s ear incisions. I have German shepherds with gorgeous pricked ears, but that’s they way they come. I like floppy ears on pits, Danes and boxers. I think it suits their personalities. I worked with an excellent veterinarian who reluctantly performed ear crops because he said that if he didn’t do them, people in the area would find other “back alley” methods, including trying to do it themselves. He disliked doing ear crops; I hated them. After having to assist on many of these over the 5 years I was there, I can say that I would never purposely put a puppy through this procedure. It’s bloody (ears are very vascular and bleed like crazy, both during and after the procedure); painful (puppies often woke up screaming, thrashing, and flinging their heads around trying to escape the pain); and since every puppy’s ear structure is different, there’s no guarantee that the ears will stand properly once they’re healed. Add to this the risk of putting a 10 to 12 week-old puppy through general anesthesia for a completely unnecessary cosmetic procedure, and it just makes no sense to me. I much prefer the look of natural ears on every breed, anyway – it’s the way nature made them! And you make an excellent point in that we have a choice when it comes to elective cosmetic procedures – our dogs don’t. Forcing a young puppy to have a painful surgery done purely for aesthetics that were arbitrarily decided upon 100 years ago just seems cruel and pretentious to me. I imagine being a veterinarian would put you into a lot of moral dilemmas like that – those at home procedures are horrendous. The procedures I saw on video were horrible enough, I couldn’t imagine dealing with all that blood in person. I’m just disturbed by the amount of proponents of ear cropping that tell everyone it prevents ear infections when there’s no evidence to suggest it. It’s purely cosmetic, and I think the first step in moving towards a more humane approach is accepting that fact.